Here is one of my favorite pieces. I stitched this back in 1991. 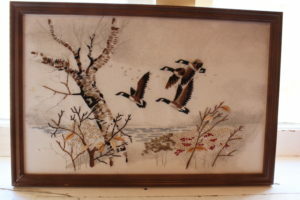 It’s a Janlynn kit called Geese in Flight. I enjoyed stitching it, though all of those French knots being uniform in size was a real challenge!